"A good story is a good story wherever it comes from, and this place is full of them.” – from Charlie’s Point of View. Colfax Avenue has been a part of almost every major era that defines the American West. It has housed the richest and the poorest, supported massive public works and the seediest criminal enterprises. If that isn’t the stuff of great fiction, we don’t know what else qualifies. 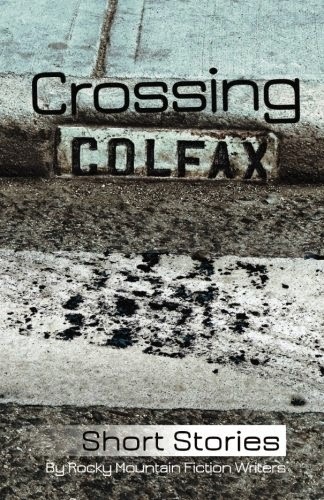 We invite you to explore Colfax Avenue – its past, present, and future. Its greatest moments, real or imaginary, and its darkest secrets. Tales of romance, action, fantasy and more – Colfax has seen it all: • Billy Shump has seven seconds to save a life – and ruin his own • Mike Ashford learns that skimming off other people’s dreams isn’t nearly as satisfying as finding his own • Mech apocalypse refugee Kal must decide how far he’s willing to go in order to survive • Detective Marc Davis works a missing child case that puts his solid lack of faith in question • Sugar thought she hit rock bottom, until her unique talent catches unwanted attention • Jackie tries to save a homeless man from alien abduction • And eight other tales inspired by Colfax Avenue Crossing Colfax includes stories from authors Warren Hammond (KOP series) and Linda Berry (Trudy Roundtree Mystery series), and past Colorado Gold writing contest finalists and winners, including Zoltan James, Martha Husain, Angie Hodapp, TJ Valour, and more. Rocky Mountain Fiction Writers (RMFW) is a non-profit, volunteer-run organization dedicated to supporting, encouraging, and educating writers seeking publication in commercial fiction. To that end, the organization strives to: • Provide an environment of support and encouragement among members • Stimulate interest in and appreciation for the art of writing • Act as a dissemination point for information concerning commercial fiction writing • Bring together authors, editors, agents, and other related professionals for the mutual benefit of all RMFW hosts the Colorado Gold Writers Conference each September and sponsors an annual writers Contest for unpublished authors. We also sponsor critique groups, publish a newsletter, host monthly events on the craft and business of writing, and periodically publish an anthology of short fiction showcasing the talents of our members. For more information, please visit www.rmfw.org. Buy the book today on Amazon.com!